Item # 319298 Stash Points: 3,995 (?) This is the number of points you get in The Zumiez Stash for purchasing this item. Stash points are redeemable for exclusive rewards only available to Zumiez Stash members. To redeem your points check out the rewards catalog on thestash.zumiez.com. Never spend more than 40 bucks on a deck again thanks to the Krooked Krouded 8.06" Skateboard Deck. This deck comes with mid-range concave and moderately pitched, wide kick tails for large pop and tons of flick strength. 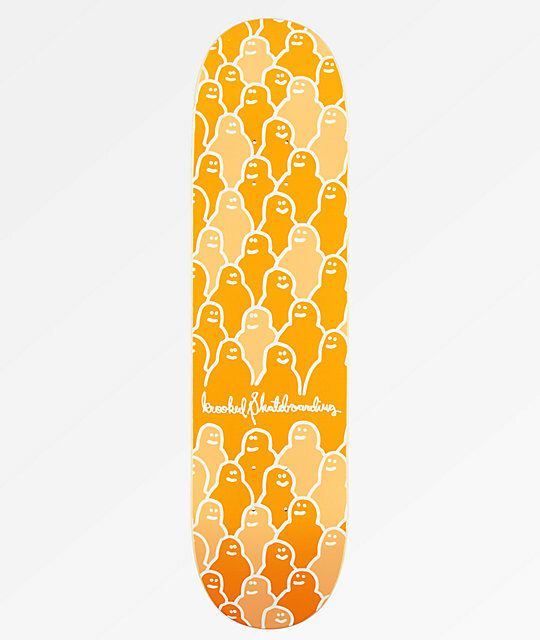 Finished with reoccurring Shmoo head graphics throughout, this bright orange board boasts a wild look. Krouded PP 8.06" Skateboard Deck from Krooked. Medium concave and slight wheel well depth. Moderate pitched, wide and slightly tapered kick tails with a more aggressive nose.